GemJam Gold Download. Download Boulder Dash game. GemJam is a highly addictive game - remake of the old Boulder Dash game. If you like Boulder Dash - download GemJam Gold. You will play this addictive game for hours and have tons of fun! The object of the GemJam game is to score as many points as possible by collecting gems. 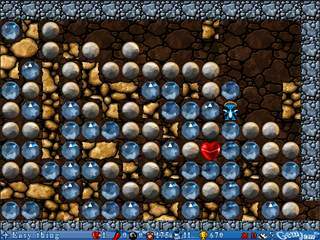 For this you walk on a map from cave to cave and pick up enough gems so that the gate opens and you can exit the cave. Beware in the meantime because various enemies are hindering your task. Collect the gems, solve the puzzles and escape before time is done. Find your way in the caves, on the journey in the ice age and the desert heat, avoid falling rocks and enemy creatures! Strategy and problem solving are a must as you try to collect all the gems. It's a challenge for all ages. The idea's simple, the execution's brilliant. Far more than just a maze game, a magical mix of challenge, charm and serenity. We have no player reviews for GemJam Gold yet.